With final papers, projects, and exams these last two weeks, my friends and I have a full load of writing to finish up. We’re all arranging portfolios, rummaging through our pieces from the beginning of the semester, tinkering with sentence structure, and trying to make papers sound the least bit coherent. I’ve been stuck staring at a screen for I don’t know how long. And, like most writers (and people in general), I get distracted. Every once in awhile, it proves to be helpful. I was working on a piece for Creative Writing a couple weeks ago when I somehow ended up lost in the world wide web. It’s that same old story: You’re looking up synonyms and definitions when, suddenly, you’re on some weird website reading different posts about technology and animals. I came across one that a person wrote about how changing the page color to your documents can take strain off of your eyes. Something about how the white background with black lettering eventually ends up making your eyes hurt? I don’t know. But their example image showed a nice, pastel green. I decided to try it. My preferred color of choice! After about ten minutes of being stubborn and trying to find where to change the page color without consulting the internet, I figured it out. I’ve been using a light blue in all of my documents for the last week and a half and, let me tell you, it’s been a blessing. Not only do my eyes not hurt as soon as they normally do, but the blue is so pretty to look at (sidenote: blue’s my favorite color)! I’ve been trying to get some of my friends to start doing it, too. I just think it’s really cool. 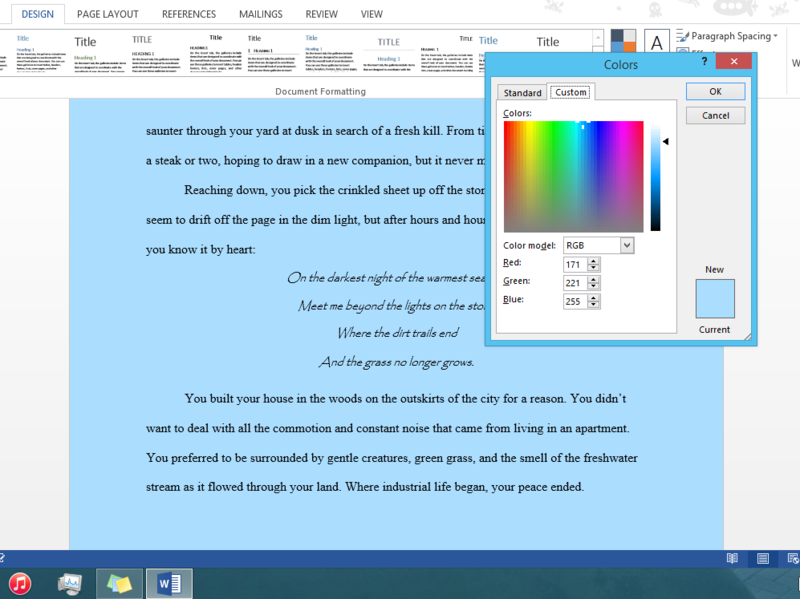 It makes the writing a lot more bearable, especially when you have to stare at a screen for hours on end. It becomes an issue, though, when you hand your friend your laptop with the open document so she can do a peer review of your work and then changes the color to an ugly yellow (Cailey). For anyone who wants to try it (I only know how to do it on Microsoft Word), you just go to Design > Page Color > More Colors > Custom and then play around with the numbers. I usually put 255 for the color that I want the page to be some shade of and mess with it from there. This particular color is Blue: 255, Green: 221, Red: 171. Happy coloring!